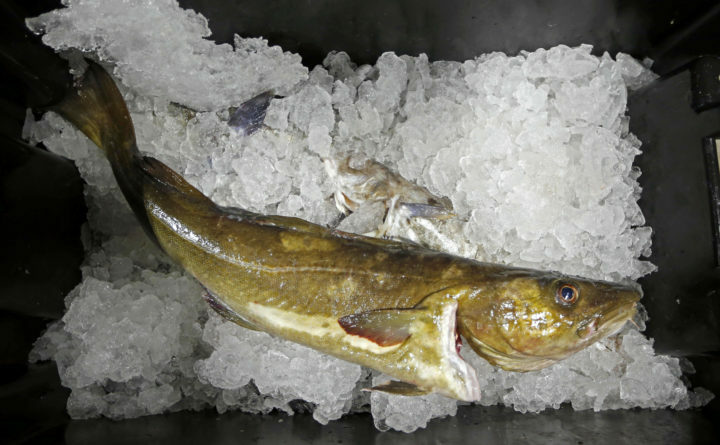 A cod to be auctioned sits on ice at the Portland Fish Exchange in Portland, Oct. 29, 2018. The state's cod fishery, once one of the most lucrative in the Northeast, has declined to the point that it had its least valuable year in more than a half century in 2018. That’s the lowest number since 1967, and a fraction of the $2 million to $16 million worth of cod fishermen routinely brought to land in Maine in the 1980s and 1990s. The volume of last year’s catch was also the second-lowest in recorded history, barely edging out 2017 at about 89,000 pounds. The few remaining U.S. cod fishermen harvest the fish in the Gulf of Maine and Georges Bank off New England. Massachusetts has long been the biggest cod producing state in the country, and its fishery has suffered the most.